Unzip the downloaded .zip and drag and drop the gameanalytics.c2addon file into your Construct 2 project and accept the installation of the plugin. Unzip the downloaded .zip and open your Construct 3 project, click Menu -> View -> Addon manager -> Install new addon…, select the gameanalytics.c3addon file and accept the installation of the plugin. Remember you need to restart Construct before you can start using the GameAnalytics plugin. When exporting for Cordova remember to call cordova plugin add cordova-plugin-gameanalytics and cordova plugin add cordova-plugin-device in the exported Cordova project (since v2.0.2 this is not needed to do anymore for Construct 3). Remember to select Cordova project when exporting and not Xcode project as it has only been tested with the “Cordova project” option. Set the build version by selecting the GameAnalytics object editing the value under the Properties section, then it will automatically be set when initializing the SDK. Set the custom user id by selecting the GameAnalytics object editing the value under the Properties section, then it will automatically be set when initializing the SDK.
? Don’t have any keys yet? Event id’s are strings separated by colons defining an event hierarchy – like "kill:robot:large". It is important to not generate an excessive amount of unique nodes possible in the event hierarchy tree. Enable info log when implementing the SDK (done in the properties of the GameAnalytics object) – remember to turn it off in production! 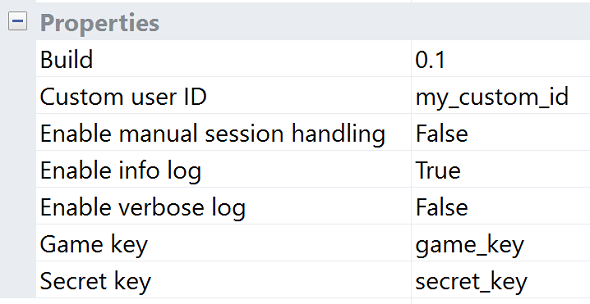 Enable verbose log when troubleshooting events (done in the properties of the GameAnalytics object). The queuing will make sure that each task is completely finished before proceeding to the next one.